Our slides are suitable for use in biology, botany, ecology, medicine, pathology, forensics, art conservation or restoration. The high-quality classic of mounting media now xylene free. CURING WITH A SINGLE CLICK! You can decide yourself when and how quickly the tissue is to be encased in polymer and protected from further damage. The gold-standard of mounting media for cover slipping machines. With effect of July 1st 2015 ORSAtec GmbH takes over the entire business activities of O. Kindler GmbH, Freiburg and the entire staff. This step combines more than 60 years of experience with young dynamic entrepreneurship. Kindler’s successful business concept will be continued as a separate division within ORSAtec. ORSAtec will successfully maintain and further develop the high quality standards of O.Kindler. The proven IVD products in the field of microscopic slides, cover glasses and mounting medium EUKITT® will also be available for you in future at the usual terms and conditions. 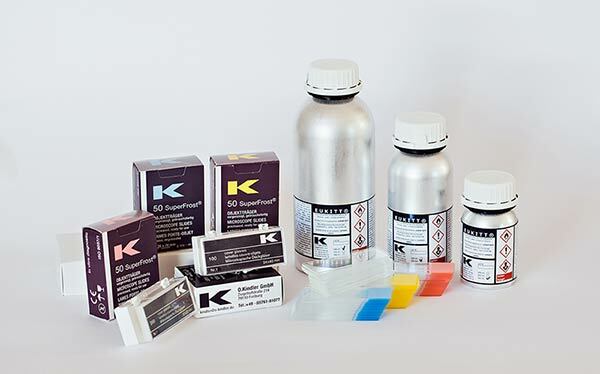 The addition to our product range of EUKITT® neo and modern microscopy accessories will allow our customers to benefit from new products of combining the longstanding expertise of O. Kindler GmbH with the dynamic ORSAtec team. The team of ORSAtec GmbH delivers specific technical expertise in the areas of analysis, research and development and legal expertise to the young company and to our customers. In the years to come this combination will certainly lead to further useful additions to our product range, not only in the field of microscopy accessories but beyond. Do you have any question to our products or are you interested in additional information? We are looking forward to hear from you. Simply communicate your concern directly.